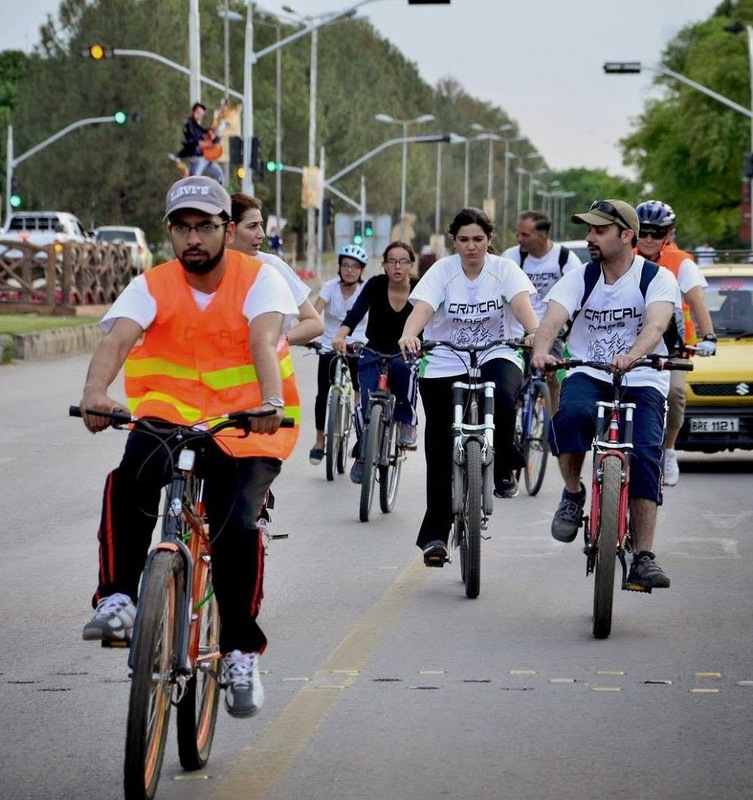 The ordinarily car-clogged streets of Islamabad presented an inspirational sight when dozens of local bicyclists came together on roads to promote pro-cycling culture in the capital city. These bicycle enthusiasts were taking part in the Critical Mass Mega Cycling Ride on a pre-determined route that started from F-9 Park and continued for over three hours. The encouraging event was arranged by Critical Mass Islamabad (CMI), capital’s only social cycling group. “We want to revive cycling as a communal sport to promote it as a sport and mode of transportation” which not only saves energy (fuel), but also promotes physical fitness, said Rana Atif Rehman, one of the founding members of CMI. Critical Mass Islamabad (CMI) was formed back in 2009 after the Lahore and Karachi group to encourage more people to take up cycling and promote it as a safer and enjoyable sport. Critical Mass is a monthly cycling event that began in San Francisco in the early 1990s and has since spread to hundreds of cities around the world. By promoting the use of bicycle among people of diverse socio-economic background, the group also aims to decrease the VIP culture in the country. In many developed countries, government officials use bicycles to travel to encourage people to adopt simple lifestyle. “We should also should introduce and promote such a culture to help our people live simpler and healthier lives” maintained Ali Mohsin, a participant. Apart from benefits, the cycle-friendly citizens also pointed concerns of the bicyclists. “Bicyclists and pedestrians are as much equal citizens as the car divers but the policies and street designs have never reflected our needs and presence” grumbled the participants. “We respect the law, and stop at each signal” said Rafia Qasim, a cyclist. “But we also need fair treatment by the authorities like the dashed yellow lines and dedicated cycle path.” The signage can only be seen on Margallah Road. The cycling group aims to bring together biking enthusiasts to peddle through the city as Islamabad city is considered by many as a paradise for cycling ventures. 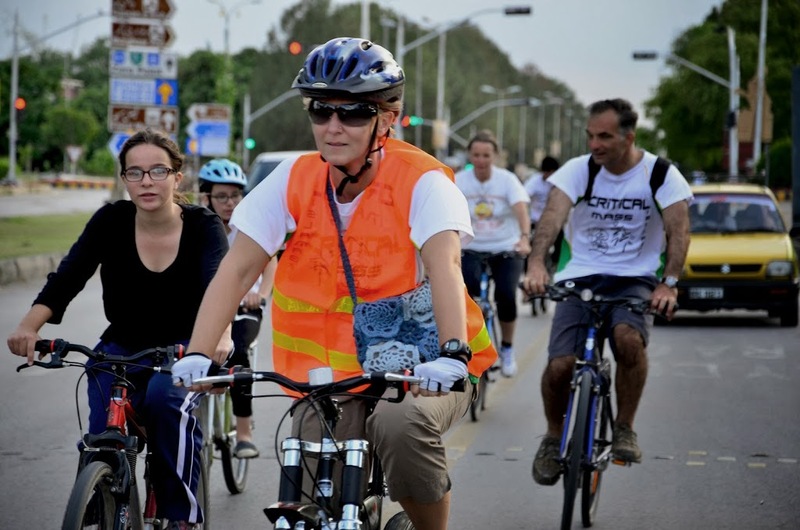 Through the event, cyclists also intended to alter the common misconception that only poor people cycle. “If you’re riding a bike, it is assumed that you can’t afford a car. But that’s not true” argued I feel it is one healthy sport which we can incorporate easily in our daily life” argued Rehman, who has been cycling since his early school days.